Euclid mentioned to King Ptolemy I.
incomparable, incredible, impressive, inimitable, inspirational land of India. Explore India aboard Palace on Wheels and feel the difference. that chugs from the dashing Delhi to amazing Agra, through the rustic Rajasthan. Cantt for a royal retreat and returns early morning for next Wednesday. This journey can be enjoyed only during the months of September to April. Palace-on-Wheels, as its Annual maintenance is taken care of. at the holiday destinations during the daytime. tale trip each halt will open up a treasure chest and enwrap you in its magic. The mystical charm of the magnificent cities en-route will not fail to capture you. The palaces, forts, havelis, sand dunes, the camel will pass by you. of the past is brimming with legends of romance and chivalry. The tale of the glorious past will be silently conveyed to you. » every saloon coach is equipped with a saloon, mini-bar and kitchenette. » each cabin has its own toilet with shower and hot and cold running water. 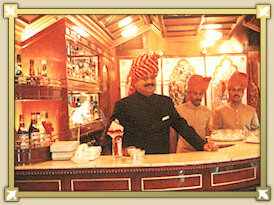 » Indian or European food is served in separate dining cars. » a panorama saloon coach with bar is waiting to be visited. » in each saloon coach a chief steward and his assistant look after your needs. » a public address system provides background music and is used for important announcements. there is a first-aid room on the train; medical assistance is available at every stopping place. a bureau de change which also accepts travelers cheques is also on board the train. Elephant ride at Jaipur, Camel ride at Jaisalmer and Rickshaw ride at Bharatpur. nature and video camera charges for entry into Parks and monuments. » Child below 5 years of age free of charge (without additional bed). » Half price for child between 5 and 12 years old. » Kindly fill up the Reservation Form so as we can cater your specific requirement. » Palace on wheel tour can be taken in part also for a minimum of four days. » The itinerary is subject to change without any notice. » Special Rates for September 2004 & April 2005. Palace-on-Wheels has reported none so far. 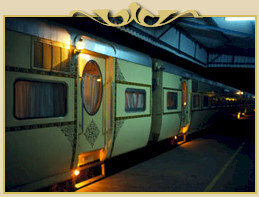 However, security has been stepped up on the super luxury train in the wake of Mumbai terror attacks. "We are receiving queries from guests booked with us. 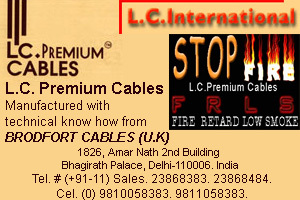 But there has been no cancellation so far," confirmed an official. While the train always had armed guards onboard, now additional manual metal detectors, CCTVs and manual frisking of luggage are a part of the security drill. Then, the countdown for the "better than the best" train has begun albeit among too many apprehensions among the leisure traveller segment. The all new Royal Rajasthan-on-Wheels (RROW), which commences its first journey on January 11, 2009, has already got 20 bookings out of the full capacity of 82 passengers per trip. The eight-day itinerary is all planned that would take the train from New Delhi-Jaipur-Bikaner-Jaisalmer-Jodhpur-Udaipur & Chittorgarh-Bharatpur & Agra-New Delhi. While the breakfast will be onboard, lunches are planned at some of the best hotels. "When we launched the Palace-on-Wheels, for two to three years we took the tour only with 5-8 people even while our break-up was 33%. But the train had to run," said a source. Today, the train is absolutely booked till 2010 with over 76% bookings confirmed till 2012. However, considering the prevailing situation, added incentives have been offered on the train that were not there earlier. Also, a 10% additional incentive is being offered to travel agents and tour operators in addition to commission admissible for RROW bookings made before December 31. "However, this additional incentive will be given only for tours conducted upto April 2009," said Mira Mehrishi, principal secretary (tourism) and chairman of RTDC. So if the Palace-on-Wheels gave the tour operators 17% commission, the RROW bookings will get them a clean 27%. For the travellers too, the fresh incentives will be easy on the pocket. "Now tourists aboard RROW have the option of paying up the entire booking amount just 15 days before the journey instead of 60 days as in the case of Palace-on-Wheels," said Mehrishi. The RROW, fabricated at an approximate cost of Rs 40 crore, is a fully air-conditioned train with a super deluxe saloon, 13 deluxe saloons, two restro-lounges, one SPA car, one kitchen car, two staff cars and two power cars. This would be the third luxury train in Rajasthan doing the circuit after immense response received by the first heritage train, the Palace-on-Wheels.